Anders Färdig founded the brand 25 years ago. He brought with him a love for clean aesthetics and the natural world, developed during his time working with Kosta Boda glassworks in the dense forests of Sweden’s Småland province. He intended Design House Stockholm to be a “publishing house” for Scandinavian design that would realise the unusual dreams of designers, much like a literary publishing house does for its authors. The ideas behind these products take on playful forms without losing sight of their function, bringing the pleasure of creativity and natural processes into people’s homes. For the Knot Cushion, Icelandic designer Ragnheiður Ösp Sigurðardóttir drew on her girl-scout experience to tie woollen tubes together in an oversized knot. With this playful approach to everyday objects, Design House Stockholm changes how people live in their own spaces by encouraging habits that favour our natural tendencies. 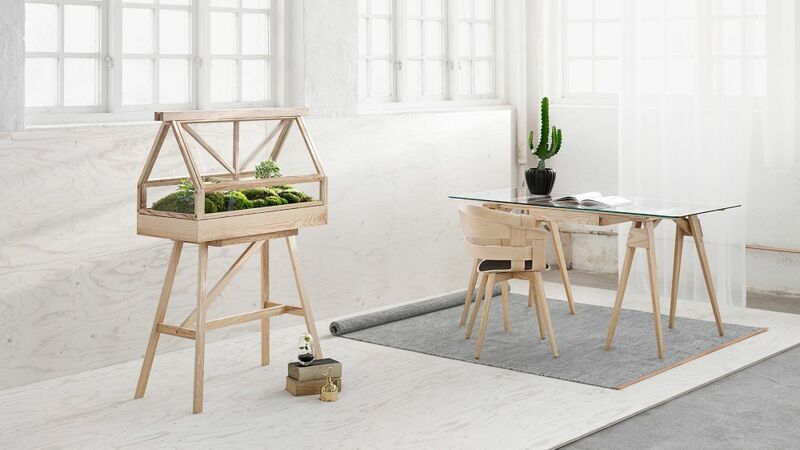 With pieces like the Greenhouse by Thai designers Atelier 2+, people can enjoy the serenity of a garden indoors and nurture plants simply for the joy of it.